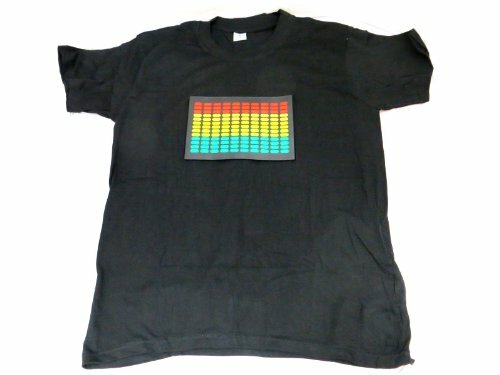 This black, small short sleeve t-shirt lights up to sounds! It is perfect for DJs, concerts, party goers, clubs, raves, and much more. Depending on the intensity of the sound, it flashes in different colors: green (low), blue (medium), and red (high). Sensor inside the shirt can be turned on or off when not in use to conserve battery and sensitivity to sounds can also be adjusted. The equalizer tag can be removed, along with the sensor, so that it can be washed. It is made with 100% cotton. Uses 2 x AAA batteries (not included). Other sizes available on my other items. If you have any questions about this product by Accessory 4u inc, contact us by completing and submitting the form below. If you are looking for a specif part number, please include it with your message.